Titan Medical teams with Ximedica to bring a novel robotic surgical system to life. Robotic surgery has become a widely-accepted medical procedure over the past decade, offered by an increasing number of hospitals worldwide. The tele-manipulator and software of robotics restore intuitive movement control to the surgeon, providing the right/left hand synchronicity that standard minimally invasive surgery (MIS) lacks. Growth of sales in life sciences robotics was in the double digits in 2013, according to the Robotics Industry Association (RIA). Global annual medical robotic revenues are currently about $4 billion and are expected to continue to grow at a 12% annual clip, reaching $19.9 billion by 2019. RIA calls surgical robots “revolutionary tools” for surgeons that help transcend human limitations by providing reduced invasion (less trauma), tremor reduction, repeatability, precision and accuracy. Image 1. 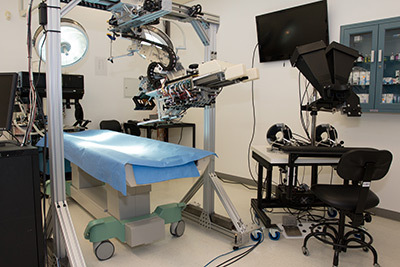 Operating room mockup scenario shows robot in left foreground, single-port entry site with instrument arms performing gallbladder surgery at center, and surgeon at workstation in right background. As a new technology advances, innovative thinking can refine performance. Such was the case for a group of researchers at Columbia University College of Physicians and Surgeons. Seeking to overcome the size, cost and dexterity issues of large, multiple-incision robotics systems, they envisioned a smaller, less-expensive, more nimble device that could perform minimally-invasive surgery (MIS) through a single port of entry into the body and be moved between operating rooms as needed. The goal was to deliver the advantages of instinctive robotics controls on a compact platform that could be adapted to a wider variety of general surgery operations than is currently available. Device developers Titan Medical recognized the opportunities presented by the researchers’ single-port concept, tested the academic prototype (at Vanderbilt University, where one of the inventors had relocated it) and licensed the intellectual property (IP) from both universities. A public company headquartered in Toronto, Ontario, Titan has a medical advisory board of leading surgeons as well as partnerships with academic institutions and hospitals around the globe. Image 2. 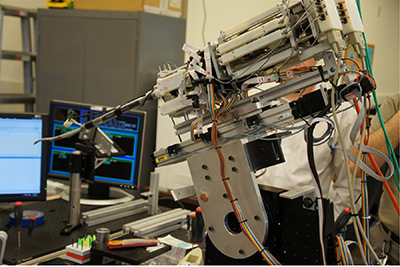 A concept is born: Columbia and Vanderbilt university researchers had developed their prototype of single-port robotic surgical tool to this point when the IP rights were acquired by Titan Medical. After considering a number of candidates, Titan chose Ximedica, an ISO-certified, FDA-registered, full-service development firm that focuses exclusively on the medical industry. “We had narrowed our search down to two potential vendors and ultimately chose Ximedica because of their capabilities, feedback from references, product understanding, communications and management skills as well as an overall feeling that they could handle all aspects of the project under one roof,” says Titan CEO, John Hargrove. With over 25 years of experience with medical devices, combination products and consumer healthcare products, Ximedica has a portfolio of clients ranging from lean startups to industry leaders. Projects have included the first-ever wearable sleep monitor, a device for facilitating the delivery of a complex gynecological procedure, an enhanced bedside respiratory system, and a number of novel drug-delivery platforms. Headquartered in Providence, Rhode Island, Ximedica was founded by Rhode Island School of Design graduates Aidan Petrie and Steve Lane, and now has offices in St. Paul, Minnesota and Hong Kong as well. Titan engaged Ximedica in the summer of 2012 to bring to life what is now known as the SPORT™ (Single Port Orifice Robotic Technology) Surgical System [see sidebar at end of document]. Dr. Dennis Fowler, one of the co-inventors of the licensed technology who is a known thought-leader in the adoption of MIS techniques, worked closely with Titan and Ximedica as a consultant. Now Director of Clinical Affairs for Titan, Dr. Fowler is also Professor of Surgical Science and Director of the Center for Innovation and Outcomes Research in the Department of Surgery at Columbia. Image 3. 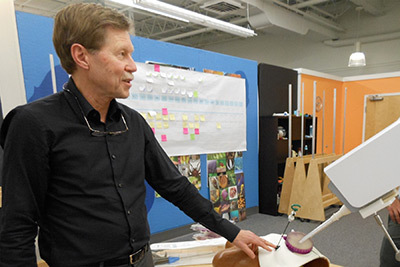 Dr. Dennis Fowler, Director of Clinical Affairs for Titan, consults with product development specialists at Ximedica as the university prototype is being developed into a functional system for Titan. Since larger, multi-port robots are usually employed for specialized operations such as hysterectomies and prostatectomies, Dr. Fowler and his co-inventors had initially targeted the more straightforward procedure of gallbladder removal (a.k.a. cholecystectomy, which is performed for approximately one million people annually in the United States alone). As the complete system takes shape, Fowler points out that the SPORT Surgical System is essentially a platform from which the technology can advance still further. Under Ximedica’s wing, development of the SPORT Surgical System reached the critical milestones of user-needs research, achieving technical feasibility and live-tissue testing in just 15 months. Development and building of the pre-production prototype is now underway, to be followed by pre-clinical and clinical trials, regulatory submission, and a pilot launch. Initiation of U.S. and outside-U.S. regulatory clearance processes is currently scheduled for 2015, followed by limited commercial launch. Titan is planning to introduce the SPORT Surgical System in Europe and the United States—the world’s two largest markets for robotic surgery. Ximedica began the SPORT Surgical System project by bringing all parties together to visualize the full scope of the challenges that lay ahead. “Before anyone even picked up a pen or started putting together a schematic we needed to understand every segment—the IP landscape, the clinical procedure, the users, the economics, competitors and so forth,” says Petrie. Meeting in person with Titan as often as once a week, with daily update phone calls and emails in between, the Ximedica team went to work. Human-factors engineers, information architects, regulatory specialists, and R&D-, design-, software- and mechanical engineers (some 60 people in all have worked on the project to date) put their heads together with the client. “Ximedica’s proprietary process development and management system marries lean development best practices with the rigors of regulatory requirements to create a smooth path toward commercialization,” says Petrie. To this end, Ximedica’s “Opportunity Assessment Evaluation” examines design, manufacturing, regulatory, market forces, resources, planning, and both client and competitor IP, then identifies associated risks and offers targeted mitigation solutions. “Risk management is critical in this business,” Petrie says. “Do you know who your competitors are, how long product development is going to take and how much it’s going to cost? It’s our job to accurately forecast, and then answer, every one of these questions as we proceed.” Ximedica provides Titan with ongoing reports that track time and expenses throughout the project. Image 4. Ximedica’s proprietary Opportunity Assessment Evaluation process considers every aspect of each medical device product development project, identifies risks and offers mitigation options. For Titan Medical’s SPORT Surgical System project, the gallbladder surgery procedure was thoroughly deconstructed (above). Budget remained under plan throughout. So who exactly is the “user” of a robotic surgery system and what are their needs? The answers go far beyond the primary surgeon sitting at the workstation: The hospital purchasing agent is considered a user, as are the secondary surgeons at the bedside, scrub nurses working alongside the doctors, circulating nurses passing materials into the sterile field and, ultimately, the patient. Obviously, a thoroughly trained, core surgical team is fundamental. But the device itself needs to be designed from the inside out to function in a manner that not only optimally enhances the surgeon’s skills, but also benefits the hospital that buys it, fits smoothly into the OR space and workflow for a particular surgery, and provides the best possible outcome for the patient. To collect the human data that would be the foundation of the SPORT Surgical System design map, Ximedica conducted rounds of in-person interviews with experienced hospital personnel—both those connected with Titan (like Dr. Fowler) and independent ones. Image 5. Ximedica team members (foreground) pay close attention to user research on the functionality of the robotic arm portion of the SPORT Surgical System during mock gallbladder surgery. Ximedica also carried out a deep analysis of gallbladder surgery itself, again in consultation with experts. Users were also asked to try out components of the system in mock-surgery settings. Together the user and surgical-procedure data informed the choices of the appropriate mix of features for the system, creating a concise product description to be designed to. The next step was to evaluate the university prototype against the defined user needs and prepare a “gap analysis” of what was required to align function with those needs. “We used a systems engineering approach to break the challenge down into manageable pieces and assess the gaps between what the existing device could do versus what it had to do,” says Ximedica Senior Program Manager Corey Libby. Ximedica provided Titan with detailed documentation as each of the technical milestones (instrumentation, master controls and visualization) was achieved. “When one of our clients has a product undergoing development, good progress demonstrates value to investors,” says Libby. Image 6. As the SPORT Surgical System project entered the advanced software-engineering stages, user feedback remained fundamental. 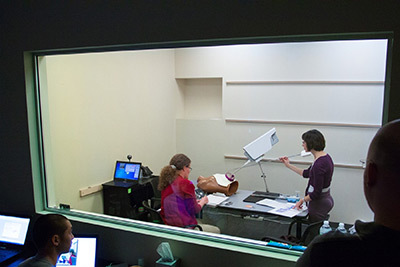 Dr. Fowler (right) manipulates the master controllers while looking through the 3D visualization system. Engineering the solutions – so how’d they do that? As the SPORT Surgical System project advanced from planning to prototype production, Ximedica’s 80,000 square feet of laboratory/engineering/product development space swung into action. To tackle the instrumentation milestone, software engineers began by establishing a kinematic framework to mathematically describe the position and orientation of the two articulating instrument arms that emerge from the device once it enters the patient’s body through the single port. “Using MATLAB (Mathworks) enabled us to investigate different instrument designs and configurations very efficiently in the early stages of concept development,” says one Ximedica R&D engineer. As the instrumentation design solidified, the group wrote additional computer code that would allow the master controllers (held by the surgeon) to manipulate the arms with all the intricate, fine-tuned movements required to perform a surgery. Initially conceived with five degrees of freedom (DOF) of movement, the arms were ultimately designed to have seven DOF based on projected clinical and commercial benefits that the SPORT Surgical System could provide surgeons in the future. An important side benefit of the extensive use of computer simulation was the realization that the in-house methodology created by Ximedica could be developed further into a training tool for the SPORT Surgical System. Dr. Fowler, who is also medical director of New York Presbyterian Hospital/Columbia University Medical Center’s Simulation Center, is enthusiastic about this discovery. Image 7. While simulation software dramatically sped up product design, it also provided a side benefit as a training tool for the surgeon. 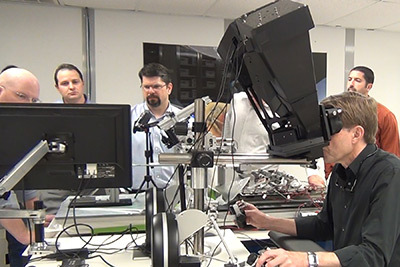 Dr. Fowler (left foreground) tests the performance of the master controllers linked to feedback from a simulation of the robotic arms in action as a Ximedica engineer looks on. The final technical milestone in the SPORT Surgical System project was the development of a sophisticated visualization system. Down-selecting from multiple potential architectures, testing both virtual and physical prototypes, the team arrived at a final custom “chip-on-tip” insertable camera concept. The high-definition, 3D camera folds into the entry device and then is deployed, once inside the body (along with the two instrument arms), to give the surgeon a direct view of the arms he or she is controlling. The surgeon sees the surgery through a 3D imaging portal at the master control station while manipulating the arms. While computer-aided design tools saved time and money on prototyping, at many points during product development the engineers wanted to prove out their design ideas with real-world examples to assess the user-friendliness, and also the eventual manufacturability, of the surgical tools they were creating. The group produced many proposed solutions to various design challenges via AM using Ximedica’s Stratasys 3D printer. “We did a huge amount of AM prototyping for this project—three to five days per week for the entire fifteen-month period,” says the mechanical engineer. Their prototyping work will facilitate actual manufacturing once the SPORT Surgical System reaches the production stage, since a number of components will have already been designed for end-use manufacturing with AM. With all subsystems developed, another round of user research established that the SPORT Surgical System was ready to move into lab- and then live-tissue testing. Successful deployment of the complete system was achieved in late 2013 and with regulatory strategy fully drafted, progress continued into 2014. “Ximedica has provided Titan with a functional prototype that answers what every medical device executive wants to know: is this product actually going to work?” says Petrie. Image 8. Full operating room setup of SPORT Surgical System prototype prior to live-tissue testing. Titan’s Single Port Orifice Robotic Technology (SPORT™) Surgical System, currently under development, comprises a surgeon-controlled single incision patient cart and a separate surgeon workstation for performing minimally invasive surgery (MIS) procedures. Estimated cost upon commercialization: $600,000. The patient cart includes two multi-articulating instruments, each capable of moving with seven degrees of freedom, and an intra-abdominal 3D high-definition image capture, processing and display system. The workstation provides the surgeon with a direct interface to the robotic platform for one-to-one control of interactive instrument arms, tips and end-effectors and for a high-definition, 3D view inside the patient’s body during MIS procedures. The instruments and a 3D-vision system are collapsed into a device capable of being inserted into the patient’s body cavity through a single incision of approximately 25 mm. Once inserted, the device is deployed into a working configuration controlled by a surgeon at the workstation. Titan currently has 7 granted patents and 12 patent applications filed in the U.S. or under the Patent Cooperation Treaty.